Theresa May said she has already started discussions on future trade ties with countries like Australia, New Zealand and India. On her India visit last year, Theresa May said Britain will be the ultimate free trade champion. 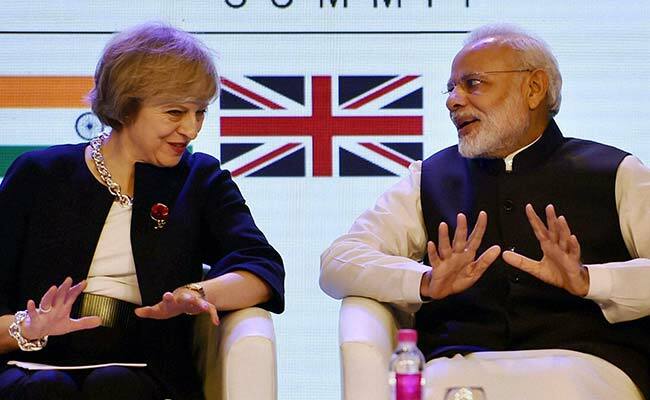 London: British Prime Minister Theresa May said talks on post-Brexit trade ties with countries like India, Australia and New Zealand are already underway as she tried to woo voters ahead of the June 8 general election. The Conservative party leader is in a fight-back mode as latest opinion polls showed Opposition Labour leader Jeremy Corbyn narrowing the gap between the two parties to just three points, with some even suggesting the likelihood of a hung Parliament. Ms May's reaction has been to shift the focus back to Brexit and away from domestic issues, which have dominated the headlines in recent days. "If we get Brexit right, I am confident that that future will be bright. As we pursue a bold and ambitious free trade agreement between the UK and the European Union - and as we get out into the world to do new trade deals with old friends and new allies around the globe - the opportunities for our economy will be great," she said. "We have already started discussions on future trade ties with countries like Australia, New Zealand and India. While countries including China, Brazil, the US and the Gulf States have expressed their interest in striking trade deals with us as soon as they can," the Conservative Party leader said. With just one week to go to the polls, Ms May has come under fire for her refusal to join a live television debate on Wednesday and used her campaign speech in Teeside in the north-east of England today to try and win back some of the lost ground. She sought to raise the spectre of a hung Parliament that could require the Labour party to stitch up an alliance with the Scottish National Party (SNP), among other smaller parties. She said, "He (Corbyn) doesn't believe in Britain. He doesn't have a plan. He doesn't have what it takes. And after last night [Wednesday's TV debate] it's clearer than ever that just 11 days after the election when the negotiations begin, Jeremy Corbyn's focus wouldn't be on trying to negotiate a deal for Britain in Europe, but on trying to stitch up a deal with [SNP leader] Nicola Sturgeon and the rest". Her speech came as a YouGov poll for 'The Times' puts her ruling Tory party on 42 per cent, down one point since the end of last week, with Labour up three on 39 per cent and the Liberal Democrats down two points on 7 per cent - at par with the far-right, anti-EU UK Independence Party (UKIP). "How dare you call a General Election then run away from the debate," Leader of the Liberal Democrats Tim Farron said during Wednesday's TV debate, where Ms May sent UK Home Secretary Amber Rudd to stand in for her. Ms May had announced early on that she did not intend to attend any of the televised debates and would be focussing on door-to-door campaigning. However, her failure to attend has faced widespread criticism. Despite having repeatedly said that she intended to follow the UK's Fixed Term Parliament that would have seen the next general election held in 2020, Ms May had called a snap poll in order to win a strong mandate for negotiations over Britain's exit from the European Union (EU). The Opposition Labour party, which was against Brexit but has accepted the June 2016 referendum result, has said its Brexit focus would be to fight to protect workers' rights, environmental protections and access to the single market for UK business in Brexit talks. The Liberal Democrats are also focusing on Brexit, warning of serious staff shortages in the state-funded National Health Service (NHS) caused by EU nationals leaving the UK.